This entry was posted in Cincinnati Bengals by Neil deMause. Bookmark the permalink. Now that the “move to LA” card has been played out, Cincinnati should say here is our best offer, “nothing.” You can’t move to St. Louis, “that’s the road to financial ruin,” remember. 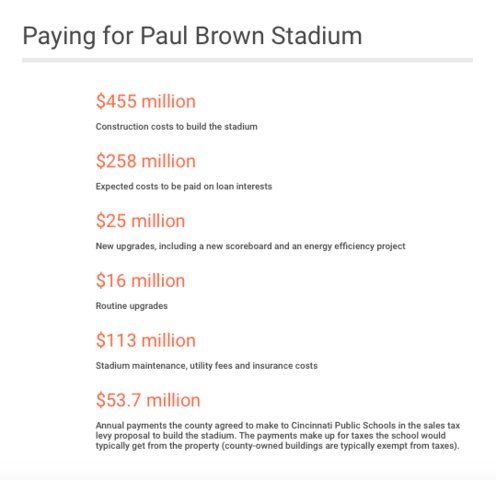 Here’s the other way to look at it: without a government-funded stadium, there is almost no chance that the Bengals would have stayed in 2000 or would continue to stay in 2016 and beyond. Until/unless Cincy experiences Minneapolis-like growth (both in people and business), the government will have to keep handling the stadium in order to make it sensible for the NFL to stay. If you think an NFL team is worth more than whatever else you could buy with a billion dollars, sure. Also, Neil, you have to stop criticizing government officials for allowing state-of-the-art (SOTA) clauses in stadium deals. Without the SOTA clause, the Rams would’ve never gone to St. Louis, period. Same for the Bengals staying in Cincy. If you’re the mayor of New York you can push SOTA clauses out, but in mid-major cities that’s just the cost of keeping the NFL. That’s simply not true. Jim Nagourney, who worked for the Rams on their lease negotiations, told me that they threw in the SOTA clause just as a “might as well ask” thing, and were stunned when St. Louis actually bit. It, and the Cincy clause, are] classic examples of cities bidding against themselves. Plus if you just have to include a SOTA clause it should be at most something like top half or top two-thirds, not something that becomes impossible unless you tear down half of the building like Stan’s dome renovation plan imposed. It’ll be interesting to see where these new stadiums will go in 15-20 years since Paul Brown, Nissan Stadium, and others are probably in the absolute best possible locations for their cities. Location is why I think Busch III will last a long long time (and the Cardinals own it). Of course, the adjacent Ballpark Village is destroying several other downtown businesses, a couple of which are closing this month. The Bengals would have moved to Cleveland and become the new Browns had the sales tax to build the new stadium not passed. At that point in time (96-98) everyone was using Cleveland as leverage. The NFL preferred putting a relocated team so that they wouldn’t have to expand. Gosh, think of all the Bengals memories people would have missed out on had the team moved elsewhere. Never mind that most people who say that wouldn’t have the stats to back this up. SOTA clauses don’t kill cities; politicians who use SOTA clauses kill cities. Without a “State of the Art” clause, the Rams would be in LA! Oh…wait…. That’s nonsense. The Bengals drew 61,000/game this season. The marginal benefits to the team’s bottom line from keeping a stadium up to “SOTA” standards is minimal. Certainly not enough to tip a stay/leave decision when the biggest piece of your revenue will continue to come to you even if you have an empty stadium. I think fans and cities underestimate the leverage they have, it takes time (generations) to build up the really loyal and profitable fan bases. Moving is costly for the NFL. I remember the Broncos threat to move from Colorado, I thought it was such a bluff, they have a huge following in the Rocky Mountain Region and if they move they become just another generic team. Stadiums like for the Broncos, Steelers, and others have been built without these clauses, Cincinnati and St. Louis could have negotiated deals without them. Yeah, government doesn’t have to buy stadiums in cool places like Minneapolis, right? Why does anyone believe that hosting (not “having”…. taxpayers never truly own the asset, just the liability) a professional sports franchise is not only beneficial but necessary? Practically every independent study ever done shows that the actual benefit of hosting a professional sports team is at best negligible. Often, the costs associated far outweigh any benefit (real or perceived). The very best outcome for most fans is to not have a team in your area… that way you can watch all games from all regions (no local blackout) for a relatively modest satellite or cable subscription fee (and the league sports package, in most cases, for another $2-300 annually). Balance that against your share of a $1bn stadium and ongoing operating costs, plus the cost of PSLs, season tickets, overpriced food and beer, merch etc. It’s time we fans adopted the owner’s mantra: “Let someone else pay the expenses and I’ll take the benefit”. And if the loss of subsidy means the NFL (for example) is reduced to a 16 team league again, oh well. I can’t make time to watch 8 games a week whether there are 8 or 16 to choose from. …. and if you believe in capitalism and efficient market theory, the NFL should have only as many franchises as it’s free market revenue can support. Surely even Jerry Jones would agree with that…. Yep. And baseball is not alone there… the NHL, for example, has a rather broad definition of what is and isn’t out of market. If you are designated hostage of a “local” team, not only can’t you watch another game while your alleged local team is playing, you can’t even watch a game that’s on a full three hours earlier if ‘your’ team happens to be playing on the west coast.